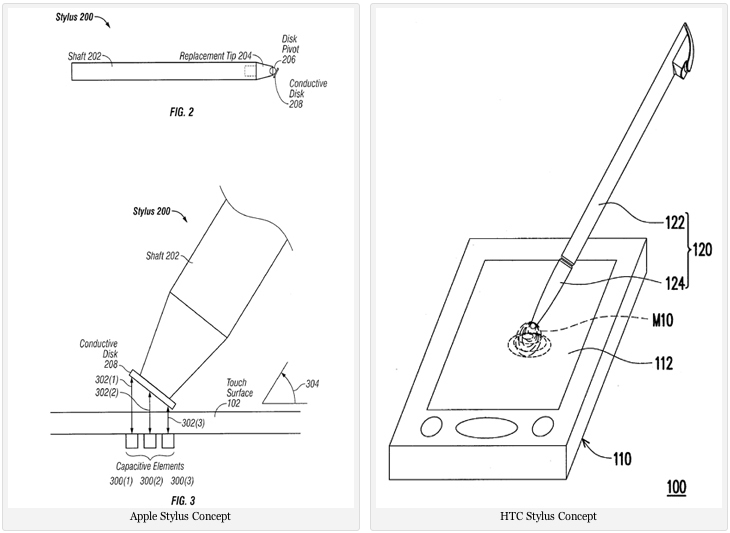 HTC files patent for capacitive stylus! Now, I don’t own anything made by HTC nor have I ever- but, that could all change should what appears in the illustration below come to see the light. HTC and others including Apple, apparently, are still thinking with the stylus. 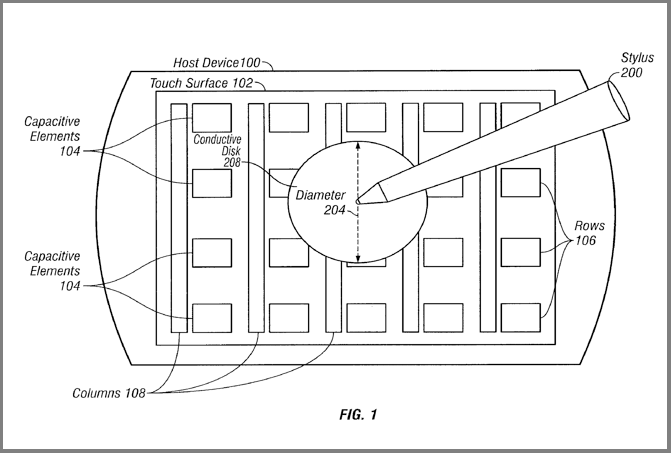 Looks like finger-only input for capacitive devices might just be getting the finger. The stylus, be it a feather, a stick dragged in the sand or high tech computer input type pen is proving to stand its ground. Maybe it’s just been with man for too long for it to just be forgotten to quickly. Whatever the case, it’s quite clear that companies who make devices with touch capacitive screens are backtracking a bit after seeing the continuing high demand for the option of having pen based data input in addition to just touching with one’s finger. Anyone who’d want to use a tablet as a notepad while walking or hold it with one hand and write quickly with the other as one does or did with the classic clipboard will agree that typing with just one hand isn’t going to be as natural feeling or productive as would the optional, simple, basic and timeless stylus. HTC’s design actually looks much better, for my purposes, than does the illustrated stylus submitted by Apple [article below] in that the tip is finer, coming more to a point, giving the user a better view of the area he’s directly working with. the tip looks to have an indicated magnetic(?) quality which reacts with the screen. Should this be the case, there could be a more intuitive user experience in that there is the possibility of having different expressions based on the angle of the pen, and possibly pressure sensitivity? Apple’s design seems to rely on a capacitive disc which rotates or swivels on a ball. This seems to be a bit of a “dinosaur” approach to designing an accessory to a device still so futuristic as the iPhone or the iPad, in my opinion. These concepts and what they may materialize into will be fun and exciting to follow. Hopefully, with the help of one of these to-be-styluses, I’ll be storyboarding on my iPad in the near future! Apple working on an iPen? Apparently, Apple, according to a few decent sources for such things, is working on or looking into the prospect of an iPen. This is great news for folks like us! We couldn’t be more thrilled about this. The stylus, per the patent illustrations we’ve found, appears to explore not just a concept for a stylus which will work on capacitive touch screens such as those found on the iPhone, iPod touch and the iPad, but a stylus with a broader range of interactivity than those currently available. The Pogo styluses are quite crappy. If you search the web for a stylus for your iPhone or iPad, chances are that you’ll mostly find links taking you to or about the Pogo Stylus or the Pogo Sketch. All indicators are that this cheap stylus is the best of what’s available. Quite sad really. Still, the success of these capacitive styluses must be a decent blip on Apple’s radar. For Apple to produce such an item, should cost next to nothing compared to other products they make and the profit per piece would probably make a simple stylus one of the most profitable items they could possibly sell. 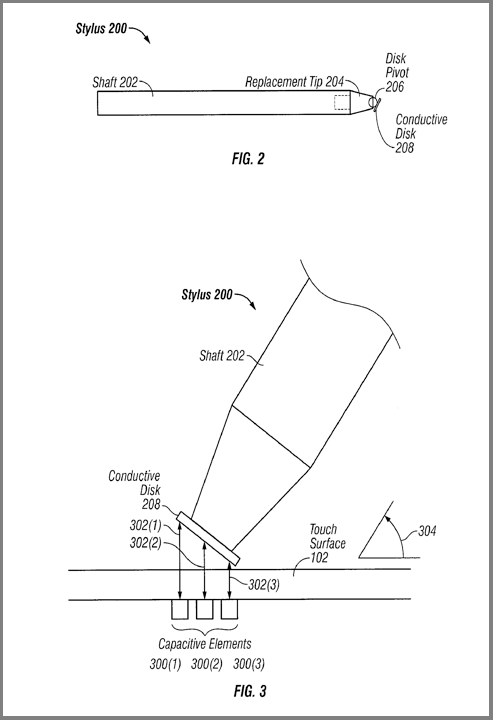 Here are the rumored to be patent illustrations of the capacitive stylus submitted by Apple. Some opinions on this news is that Apple is just protecting the idea with no real intention of actually developing it into an actual product, simply so that others cannot use the idea. We think Apple has proven that they are much smarter than that. Steve Jobs doesn’t like pens. He made that very clear when he first launched the iPhone in 2007 but he must be noticing that a decent number of loyal Apple customers don’t share his take on the issue. By adding an iPen, Apple would flutter the hearts of many artists, writers, and just the general person who will naturally and instinctively want to hold their iPad in the same way that clipboards are held. Then, you have all of the regular folks out on cold places who like to wear gloves to keep their hands warm. They want to use one of these devices and they have to take off a glove. An iPen would let them keep their gloves on.